Oreo the Boston Terrier / Papillon mix (Bostillon)—"She has the vibrant imagination of a Papillon and the sweet, loving temperament of a Boston Terrier." The Bostillon is not a purebred dog. 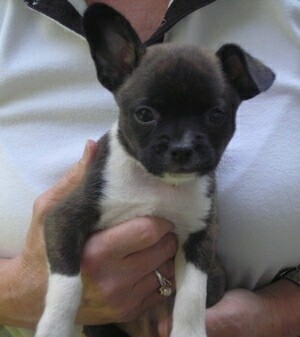 It is a cross between the Boston Terrier and thePapillon. The best way to determine the temperament of a mixed breed is to look up all breeds in the cross and know you can get any combination of any of the characteristics found in either breed. Not all of these designer hybrid dogs being bred are 50% purebred to 50% purebred. It is very common for breeders to breed multi-generation crosses. Oreo the Boston Terrier / Papillon mix running across the yard. "This is my Bostillon (Boston and Papillon) Athena. She's very agile and intelligent. Just this weekend I took her to a house with a pool, and when I jumped in she followed. She loves the water! Her swimming speed is so fast that it's almost humorous. I took these two pictures at the local dog park in Scottsdale, AZ. She's 1 year old. She runs faster than almost all the dogs at the dog park. She's great with kids and always has a natural gentleness when playing with them. She can jump about 3 to 4 feet straight up into the air. People are always impressed when she leaps into the air to try to get the tennis ball, which happens to be her favorite toy." "Sophie, our Bostillon (Papillon and Boston Terrier mix)—she is loving, highly intelligent, and very quick to learn. She has a very loving nature and loves to nap on a lap just as much as she enjoys a walk or some time playing fetch. She is two years old in this picture. She plays extremely gently, even when her tail is pulled or small children are rough with her. She tends to jump, but is learning not to do so very quickly. She is also very quick and eager to run if you will run along. Sophie is a wonderful part of our family and kind to all visitors. What a wonderful hybrid."